A Personal Perspective on Mohammed bin Salman's Visit to the U.S.
On March 23, 2018, Al Jazeera Arabic’s program Min Washington, a weekly current affairs show hosted by Dr. Abderrahim Foukara, interviewed National Council on U.S.-Arab Relations Founding President and CEO Dr. John Duke Anthony. The focus of the interview was on Saudi Arabian Crown Prince Mohammed bin Salman bin Abdulaziz Al-Saud. The Crown Prince is currently visiting the United States. Following is a transcript of the interview. Included at the end is an additional question asked and answered that did not make it into the program’s final cut. The transcript has been edited for clarity. Min Washington: Founding President and Chief Executive Officer of the National Council on U.S.-Arab Relations Dr. John Duke Anthony has followed developments in the Arab region closely for decades. This includes Saudi Arabia. Dr. Anthony, how do you assess the visit of the Crown Prince to the United States and its timing? Dr. Anthony: What Saudi Arabia’s Crown Prince is doing is what he has not yet done extensively beyond his meetings with U.S. officials in Washington, D.C., and various private sector leaders in New York City. In this instance, he is spending time in those two cities again but with additional groups and individuals in both places and, also, in other locations such as Boston, Houston, Seattle, Los Angeles, and Silicon Valley in California. Beyond meetings in Washington, D.C., Saudi Arabian Crown Prince Mohammed bin Salman’s visit to the United States has included (clockwise starting at top) discussions with Christian and Jewish religious leaders, meetings with former U.S. leaders such as former President Bill Clinton, coffee with businessman and philanthropist Michael Bloomberg, and the signing of an agreement with SoftBank and its founder Masayoshi Son to develop an ambitious $200 billion solar power project. Photos: Saudi Press Agency and Saudi Royal Court. He is doing this for two broad strategic reasons. One stems from his awareness that he is largely unknown to large and significant sectors among the American people. The other is his wanting to build on the meetings he had last year with President Trump and members of his staff – here as well as in Riyadh. Among other segments of the U.S. government as well as the nation’s foreign affairs community and the media, he was much less well known prior to this visit. His visit is therefore in large measure an effort to get to know better additional important segments and players within Washington officialdom as well as leaders among other key sectors of American society – and for individuals among these segments, players, and sectors to get to know him better. In so doing, he is addressing the Kingdom’s needs, concerns, interests, and key foreign policy objectives. The United States is doing the same thing. We, too, have needs, concerns, interests, and foreign policy goals. In these regards, the two countries are of course not exactly alike. In many cases, however, what they are seeking to achieve intersects. Until now, however, what is known about this Crown Prince is very little. What is more, he is even less well understood. The visit is intended to help him in that regard. His time spent here can be seen in part in that light. By the end of his visit, he should have been able to provide a clearer and more accurate picture of his character. This dimension of his visit is very important. There is no question that, regarding what he seeks to accomplish, Crown Prince Mohammed Bin Salman has thus far won the benefit of the doubt in terms of the U.S. government. Accordingly, there is no doubt that this part of the visit is valuable to him and could be even more valuable in the future. Crown Prince Mohammed Bin Salman is scheduled to be here for nearly two weeks. There are certain dynamics that characterize any major foreign dignitary’s visit to the United States for such a length of time. One is his interest in addressing whatever may be on his mind. The other is the flip side: he knows he has little choice but to address also whatever issues his American hosts may put to him – and to do so directly. Min Washington: The timing of the visit, of course, comes when there are questions about the ability of the Crown Prince to implement his vision for the future of Saudi Arabia. At the same time, there are lots of questions about the future of President Donald Trump. These have to do with the ongoing investigations into the issue of alleged Russian interference in 2016’s elections. In this light, how do you think Washington is viewing the future of Saudi Arabia? How does it see the situation in light of the internal and regional situation that the Kingdom is facing? Dr. Anthony: Generalists may differ in their answers. However, because the Crown Prince has been in his position for some time now, and various among his positions and views have become well known, there is no serious discussion or debate about these two questions among specialists. Among some of the so-called “think tanks” – or public policy research institutes, many of which might as well be regarded as “agenda tanks” given that in more than a few of them little in the way of original thinking transpires – it is the same. There is little difference among them in understanding why the Crown Prince is here. This said, in the media, and among the Trump administration’s politically appointed representatives, it is different. It’s the same in Congress, where he is even less well known. Saudi Arabian Crown Prince Mohammed bin Salman and Saudi Arabian Ambassador to the U.S. 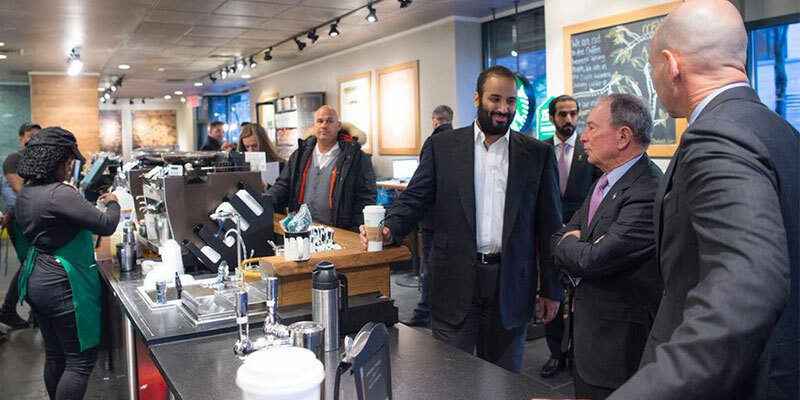 Prince Khalid bin Salman met with Republican and Democratic Members of Congress while recently in Washington, D.C. Photos: Saudi Press Agency. From a more clinical and detached perspective, however, what’s fair and accurate to note is what this visit will likely make the Crown Prince more aware of than he was before. Militarily, economically, financially, technologically, scientifically, and educationally, the United States ranks first in the world out of 204 countries. Among the 195 members of the United Nations, America’s overall position is first in that category, too, and not only because it is the host and the largest contributor to the organization’s operations. Indeed, no other country approaches the level of the United States in these power-delineation categories. Min Washington: What does this mean? Dr. Anthony: It means that, regardless of how great may be a people’s ill-will or the nature and extent of their good feelings towards the United States, its leaders will want to have as close, continuous, and deep and diverse as well as reciprocally rewarding a relationship with the United States as possible. This applies not just to Saudi Arabia but practically every government in Africa, Asia, Latin America, or elsewhere. Ideally, the leaders of other countries want their relationships with the United States to proceed as much as possible on the basis of trust and knowledge. Yet these things do not happen by accident or coincidence. When they occur, they are the result of the hard work of people who are keen to further their and their allies’ mutually beneficial interests. Certainly, what Crown Prince Mohammed Bin Salman is presently trying to do in his visits to numerous American cities should be seen in the light of his trying to demonstrate this. In return, we are receiving him and doing our part to place our respective mutual interests on a firmer foundation for the present as well as for the near term and longer run future. Min Washington: But back to the question of the likely impact of all the tensions surrounding this Presidency. Is it likely to be the case, as many say, that America’s interests and its relations with other countries are likely to remain intact in the long run largely because of the impact of the country’s institutions? Dr. Anthony: Yes and no. There’s no doubt that the impact of the country’s institutions has long been important. There’s no doubt, either, that this is likely to remain the case. However, depending on the issue or issues, there’s also no question that other things can be of even greater importance. Min Washington: What do you mean? Dr. Anthony: An example is leaders. What they do and do not do regarding various opportunities or challenges can sometimes override what institutions do. There’s no question, nationally speaking, that this is what is happening right now. More broadly, the reference is simply to the fact that there are different kinds of forces, factors, or phenomena other than a country’s institutions that can and sometimes do come into play and have a role in whatever transpires. The interview was transcribed by Asmaa Katah at the National Council.